Do I have a problem here? I mean really? Do I need to (insert American accent here for the full effect) “go see someone?” Because for some reason there are products that I just can’t buy only one of. Why buy one when two will do? 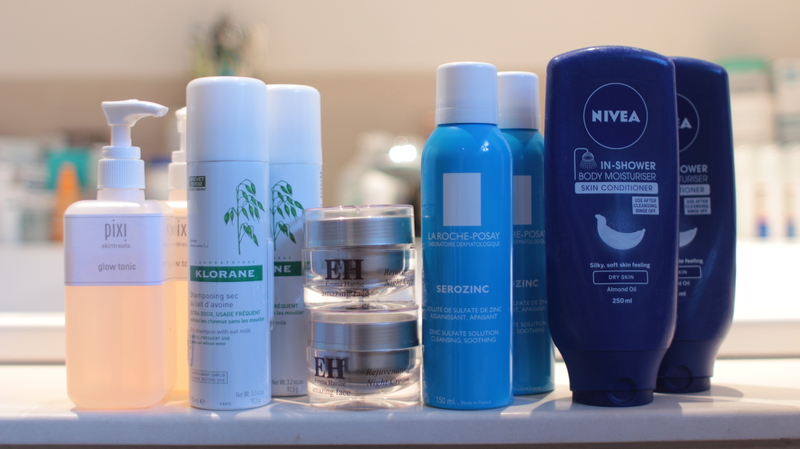 I have so many products that never see the bottom of the bottle/pan/tube (insert any container you care mention here), yet there are many others that are just hanging out in my bathroom and dressing room in their multiples. The Pixi Glow Tonic is a no brainer. So necessary, yet so difficult to get hold of. It’s easier to get a table for dinner at Loulou’s than one of these pump-action babies! So when I can get my hands on one of these, you can betcha I’ll be stocking up. Klorane’s Dry Shampoo with Oat Milk – likewise. I’ve recently been converted to the cause of the dry shampoo brigade. Not only does it give me an extra day between washes, just a couple of whooshes with this imparts that much needed volume and weight in my flyaway hair. As a dark brown haired gal, it’s hard to find a dry shampoo that doesn’t make me look like I’ve gone prematurely grey, but Klorane seems to have got the formula just right. More skincare favourites in the form of the luxurious, nourishing Emma Hardie Rejuvenating Night Cream, which I turn to in times of dry skin needs or as a bit of an indulgent nourishing mask when I’m watching TV in my pyjamas (is that a severe case of oversharing?) Until La Roche Posay see fit to sell Serozinc here in the UK, I can’t see me ever buying less than one cannister at a time. I buy this healing, soothing, rehydrating, rebalancing facial spray (is there anything it can’t do?) online from whichever ebay seller has it in stock…but I’m sensing an imminent trip to Paris to stock up on it myself…any excuse! And yes, I’ll take shopping requests…. And lastly, my Nivea In-Shower Body Moisturiser will come as no surprise if you’ve seen my September Favourites video (click to watch here). Perfect for time-hungry girls, this saves all that faff of waiting for your moisturiser to sink in before getting dressed. A definite must have and at around £3.50, this is an easy-on-the-pocket bulk buy! What are your multiple-buy must haves? Or am I alone in this obsession? I agree with you about Pixi Glow Always buy more than one. Its never a good thing to be caught short!